A uniform neural net of brain cells - a brain chip - has been created by a team of scientists lead by Yael Hanein of Tel Aviv University in Israel. 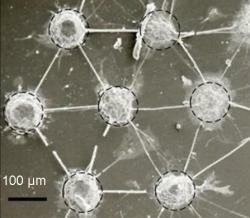 100-micrometer-wide bundles of nanotubes were used to get the rat neurons to form regular patterns on a sheet of quartz. The neurons bind to the nanotubes, which are placed close enough for the nerve cells' axons and dendrites to make links between cells and clusters. The electrical activity of the brain chip can be easily measured because carbon nanotubes conduct electricity. According to Hanein, this method results in more uniform neural networks; they also last longer than other artificial networks of neurons, lasting up to eleven weeks. Science marches on - but sf writers were there first. Update 25-Jul-06: I forgot to add a reference to an earlier item - the laminated mouse brain from Cordwainer Smith's 1962 story Think Blue, Count Two. Take a look at an article on an earlier real-life version of head cheese - Rat Neurons In A Dish Now Playing Flight Simulator. Read more about how Neurons self-organise to make brain chips.